​The word ROMEOs stands for "Retired Old Men Eating Out". We meet once a week to have breakfast together. We are drawn together because we all enjoy one another and eating. We are blessed to be able to help people in need. Our activities allow us to put into practice the lessons taught by the Good Shepherd. Collecting food from the County Food Bank every Wednesday in one to three of our members' private trucks, and delivering it to the SHARE food closet (located in the basement of the Federated Church). When the food arrives, a team of ROMEOs unloads the food and stores it at SHARE. 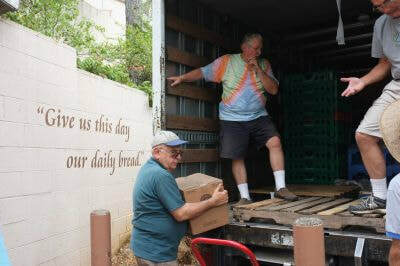 About two times a month (generally on a Tuesday), one or two members use the Food Bank's larger trucks and deliver more bulky items to the SHARE closet. Once again, a team of ROMEOs meets the truck at SHARE, unload it, and store the food. Every Saturday, one of our members (rotating the responsibility), in his own vehicle, collects surplus Safeway bread, pastries, milk, eggs, etc. and delivers the food to SHARE.